Summer camp. One week. Off on an adventure alone. No friends. My son was ready. The question, Was I ready? I never went to a true summer camp. Besides an emotional college good-bye, my first real adventure came when I was 21. And I don’t think my mom was ready either. Three weeks in Europe. A friend and I were leaving after college graduation to tour major European cities. My parents and I waited at the Norfolk, Virginia, airport for my friend and her parents to arrive. She was late—really late. I called her house from a pay phone. They should be at the airport, her sister said. I quietly waited, thinking. When my plane started boarding, I stood up and told my parents good-bye. “What? You’re going?” my mom said. I sure as hell was. I didn’t work as a cashier for five months selling cigarettes to an old man with pink fingernails and a dress for nothing. I didn’t max out my credit card and beg and borrow the rest of the money for my trip for nothing. I was going to Europe! We hadn’t talked about or looked into another flight. Now there was no time. I was there. I was getting on that plane. I said I’d call when I arrived. I didn’t have time to think about what I’d do once I landed. I had only ever flown once before. I felt nauseous and tried desperately to sleep folded over onto the lap tray. When we landed in London, I had no idea where to go. Signs everywhere warned not to pick up unattended bags. What? Why? A crowd of people held signs with names on them. One of them was my driver. I made it to the hotel exhausted but couldn’t check into the room for two hours. I called home and I learned my friend got stuck in traffic and had caught the next flight. Relief. We spent the next three weeks navigating centuries-old castles, picturesque gardens, bizarre hotel showers, and each other’s moods. Thankfully, she still talks to me. We found our way into an Austrian pharmacy to replenish my motion sickness medicine, using only my idiotic gesturing and Southern English to communicate. We ordered from menus with decent success, though for the life of me I could not remember to request still water and always ended up with fizz. Though I yearned for home-cooked food and sheets not made from terry cloth, I was having the time of my life. My mom called one of the hotels looking for me, worried. On my end, there wasn’t time for phone calls. I think as mothers, we dissect our kids’ situations. There is no big picture but little pieces. We find comfort in odd details to help us cope with those parts that really bother us. I knew my son going to camp would be hard, but he’s been away before. Baby steps. My mom found comfort in the fact that I would be with a friend, that she knew where she could reach me. I put a kink in part of that. I filled out loads of paperwork for my son. He’ll have fun, I thought. I’ll worry. But at the end of the forms and phone numbers and descriptions of my son’s personality, a reminder: no phone calls. Panic. What if he needs me? More likely, what if I need him? Like my mom then (and sometimes now), I just wanted to be able to hear it, one sentence even: “I’m OK.” But I take comfort in the fact that his camp is less than an hour away. In our same town. And he’ll probably have fun, even if I won’t sleep for a week. As a mom, my experiences with struggle and independence and finding my own way are what get me through letting my kids go—even if it’s just to the other side of town. 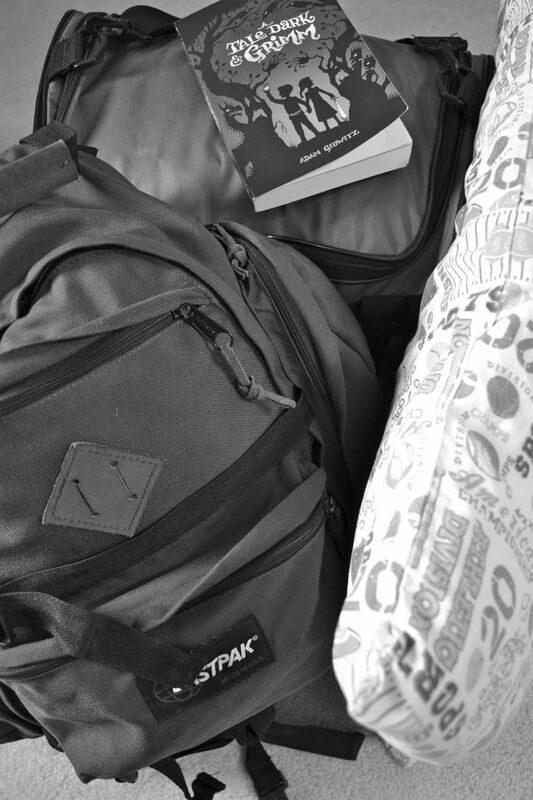 Ready for a week of fun…I hope!